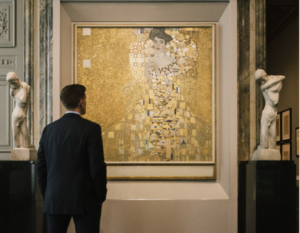 The Neue Gallery NYC, Contemplating Klimt’s ‘Woman In Gold’ Image: A McGravie-Wright. In our contemporary world, most cultural tourists approach their visits to the large scaled museums of the world from a time poorperspective. Typically, today’s traveller spends their first hour standing in lines for tickets, maps and or waiting for the blockbuster exhibition to allow the pre-determined number of people through at their allocated pre-booked time for viewing. Some would argue that there is no right way to experience a museum, that is should be based on personal preference. Most people go to a museum to enjoy being there. Somehow our modern experience however, leaves many with a sense of frustration due to ‘too much to see’ and or ‘too many people surrounding the most popular art works’ which if not properly controlled by the museum security staff, causes great frustration to the more serious art lover. Visitation surveys claim that the average art visitor spends approximately 15 to 30 seconds in front of a significant work of art. Sadly, many younger visitors seem more interested in capturing themselves in front of a specific art work to send out through social media as proof they have been. This begs the question however, what does this kind of visitation actually bring to the hurried art visitor? What happens if we slow down the whole experience? What if we prioritise setting time aside to ensure we have ample time to view a particular art work that we are drawn to, rather than rushing crazily through the collection, taking non-stop photos of the art works we think we must take home. The smart cultural tourist will turn a daunting visit to a huge museum into a more digestible and personally meaningful visit, by seeking out those works that specifically link you to your interests. 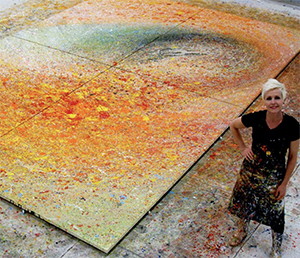 To achieve this it is now necessary prior to most visits, to find the most relevant works online to help you identify in advance the relevant art works and even which art galleries they are located in. This approach of pre-planning the museum’s collection online in advance of your visit allows you to make good use of your limited viewing time. What can we learn from the museum experience this photo is illustrating – documenting? 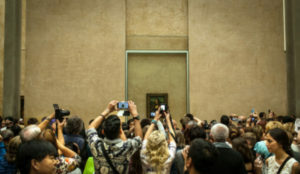 Trying to capture ‘The Mona Lisa’ Credit Guia Besana, The New York Times. When I last visited the Louvre, I specifically choose to take a night tour as there is usually less people visiting than during the day. The tour had a specific theme of looking at the ‘significant women’ of the Louvre. Of course, the majority of visitors in my group all wanted to see the Mona Lisamore than any other art work there. When we finally managed to get upstairs to the new salon the work has been rehoused in, there was a sea of people already there, and every single person was trying to take a photo in exactly the manner these people are shown doing. Sadly, in this situation, there is no way you can sit and contemplate. “Pick a wing and begin by wandering for a while, mentally noting which works are appealing or stand out. Then return to one that beckons. For instance, if you have an hour, he suggests wandering through the collection for 30 minutes, and then spending the next half-hour with a single compelling painting”. When selecting a significant art work to meditate upon, try to make sure you choose a work that specifically resonates with you. Afterwards try to document in some way how that experience made you feel afterwards and perhaps even at a later date review what you have recorded. Previous research, including a study led by Stephen Kaplan at the University of Michigan, has already suggested that museums can serve as restorative environments. Further to this point, Daniel Fujiwara at the London School of Economics and Political Science, has found that visiting museums can have a positive impact on happiness and self-reported health. In the US now, a number of museums now offer “slow art” sessions that encourage their visitors to approach viewing the collection at a much slower pace. For those who are interested, here are some links.